What if you had walked beside the Virgin Mary from the Annunciation to the point at which she and Joseph found Jesus in the temple? How might seeing Christ as a child impact you and your faith? WINE: Women In the New Evangelization's second, six-week scripture study follows the infancy and early years of Christ as seen through the eyes of Mary and other familiar and imagined women in the gospels. Founder Kelly Wahlquist and ten other members of WINE uniquely blend scripture reflections, imaginative encounters, and visio divina "sacred seeing" with practical spirituality and discussion questions that will help you take a prayerful and creative journey through Advent and the Christmas season. Week by week, you will dig deep into each of the scriptural vignettes of Jesus' early life and grow in your faith as you learn about virtues such as humility, patience, charity, reverence, prudence, and courage. Each chapter uses an image that allows you to practice visio divina, the ancient practice of praying with sacred art. The images are included in an eight-page, full-color insert. 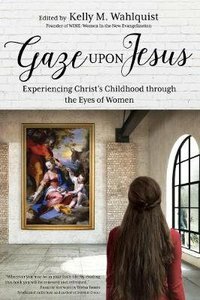 About "Gaze Upon Jesus: Experiencing Christ's Childhood Through the Eyes of Women"